The Skatomatics gonna get famous. There's a punk rock angel watching over us. In 2004, the Skatomatics released their first independent EP – Skatomatics for the People. It climbed the charts and reached the #2 slot on CITR’s college radio chart, outplaying groups like indie-kings Modest Mouse, all-Canadian buzz-band Broken Social Scene and even that dude Jack White beat up from the Von Bondies. 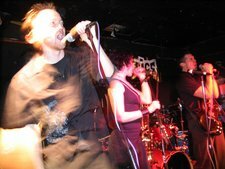 2006 sees the release of their first full-length CD: High Maintenance. But what this band really lives for is hitting the stage and rocking the party. Oh yeah, and a limo full of strippers and coke would be totally nice too. “…Vancouver is experiencing one of it's Ska revival frenzies. The Skatomatics are in the vanguard of this movement, and anyone fortunate enough to have witnessed one of their energetic, not to mention sweaty, live shows can attest that these guys are the real deal."